Ages 3 to 5 years. Hundreds of French workers helped Bartholdi measure and build the statue. It was hard work! The statue was so big that it had to be built in pieces. Its finger was taller than a man! Millions of people visit the Statue of Liberty each year. Here, in just 250 words, are answers to many of the questions that children are sure to have during those visits. The text and art were reviewed by an historian at the statue. And the board book format makes it perfect for young travellers whether armchair traveller or visitor. 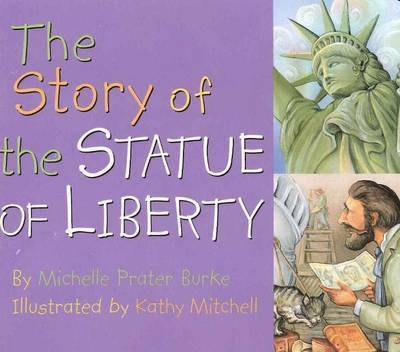 Michelle Prater Burke spent many hours researching the story and speaking with an historian at the Statue of Liberty. Along the way, her three children became well-informed on the topic as well! She lives in Old Hickory, Tennessee, with her family. Kathy Mitchell was born in Ohio and studied at the College of Design, Architecture and Art at the University of Cincinnati. Kathy now lives in Santa Monica, California, with her husband, their two children, and various pets that include a bearded dragon, cockatoo, and Basenji.